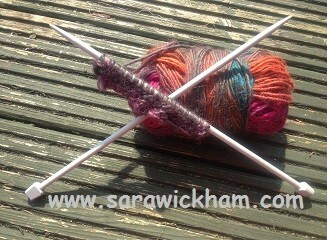 Lately I have been working on an article on knitting, which feels a little strange in some ways because knitting is more of a Winter activity for me and it is FAR too hot here in Wiltshire to even think about such things this week! But even in the face of the wrong kind of knitting weather, there is much that still needs to be explored and I wanted to continue the discussion, even if just by a few paragraphs. Much of what I am writing on this occasion (and I will, in time, post the article up, but of course I have to let it be finished and published and read in its original form first) is rooted in a discussion of Michel Odent’s thinking. This is only fitting as it was he (as far as I know) who first remarked in the midwifery literature upon what was at the time an unremarkable sight: a midwife sitting in the corner of a room, quietly knitting while a woman laboured to birth her baby. (As I note in the article, sometimes it takes an ‘outsider’ to a culture to notice the things that are fundamental to that culture). Several years’ worth of articles and discussions later, he decided that we should have a Silent Knitting Workshop at the Mid-Pacific Conference on Birth and Primal Health in Hawaii. I recall, when he asked me if I would speak at the conference, that the silent knitting workshop was on the agenda pretty much before anything or anyone else. He was very excited about it, and mentioned it every time we spoke. Quite how I then managed to arrive in Hawaii without any knitting to work on is beyond me, though a hectic schedule and circuitous travel route through a number of other countries and states (during which I almost achieved my ambition of appearing on Border Control, but that’s another story) may have played a part. I am never without at least one craft project, however, and so it was that I trotted off to the Silent Knitting workshop bearing a half-made cross stitch elephant. And a friend’s daughter, who had decided she needed to come with me because she was ready for a break from hearing her mum give the same presentation for the seventeenth time. I said that of course I would be delighted to have her company, although I wanted to be sure that she understood that this was a silent workshop where we were going to knit – or cross stitch – without talking. 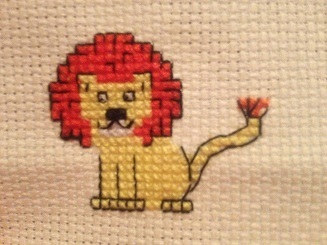 As it happened, this was no problem at all because she needed to learn to cross stitch a lion. I had long known that he had knitted as a child, and so I knew it wouldn’t be hard to help him remember, although I suspected that my grandmother’s chant of ‘in, round, through and off’ which I learned to recite while making each stitch was probably somewhat different from any French mantra that Michel would have been taught. It was fascinating to try and help someone remember a hand skill without actually being able to talk to them in any language, but soon enough he was knitting steadily away. My next task was even harder: trying to teach another hand skill (that of cross stitching a lion) to someone who has no prior experience … without using any words … while periodically needing to return to help Michel locate the occasional stitch that had been mislaid. Actually, we all got on OK, and at the end of the workshop Michel proudly handed me a piece of multicoloured knitting (still on the needles) as a gift, whilst on my other side at least half a lion had been beautifully cross stitched. I had probably only spent about a quarter of the time working on my own project, but that was unimportant compared to the satisfaction of having shared my skills and helped facilitate the creation of other masterpieces. The time I did spend sewing and reflecting myself did, however, lead me to ponder something that became the foundation for part of the article I’m writing. The association that Michel makes between the repetitive nature of knitting (as practised by the midwife) and the provision of reassurance at birth is, in my mind, very worthy of reflection. I can also see how this might help the flow of oxytocin and have written about such associations myself. Yet I have come to think that this important observation is actually only one tiny element of a far bigger picture. 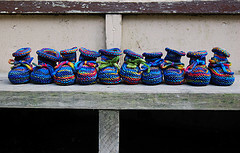 The value of craft comes in many other dimensions and forms as well, and more than one of these might be relevent in relation to birth and midwifery. Not all knitting projects are equally repetitive, and some require far more concentration than might be appropriate for a midwife who needs to also be aware of the birthing woman. Both knitting and many other kinds of craft bring a variety of valuable states of mind, body and spirit and we have only really begun to start reflecting on such topics, and on the relationships between women, craft and birth. Conversations on this topic – and I use this word in its broadest possible sense, because I understand the value of silence as well – need to continue, and I for one am delighted to have yet another justification for spending more time undertaking and chatting about craft activities!